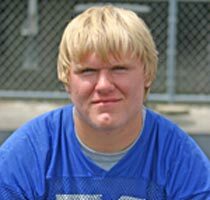 The loss of prized recruit Matt James has already revived talk of the Notre Dame head coach curse, which allegedly dates back to when Gerry Faust, a complete bust, was signed as head coach. "He was the start of the curse of the modern Notre Dame program – they’re good at a lot of things in South Bend but hiring coaches isn’t one of them." wrote Dan Wetzel at Yahoo sports. The tragic death of his top recruit is obviously going to revive talk about Brian Kelly being cursed too The young man fell to his death from a balcony during an outing in Panama City Florida. With him went a huge part of Kelly's pans to plug the holes in the offensive line from last season. "Six-foot-eight, 290-pounds and a big ol' teddy bear," said Kelly said remembering James, who he knew for years. "He came to Notre Dame because of his personality. He wanted to make a difference. He wanted to stand out. That's the kind of kid he was. That's what I'll remember about him." The team seem to be taking the loss of James to heart also. "Words can't express the feelings that have flown through the locker room," Irish quarterback Dayne Crist said. "Matt James was just an incredible person. Forget football. He was just a great person. He'll definitely be missed and he'll definitely be with us from here on out." "Everybody on the team feels like we lost a brother," Kyle Rudolph said. "There's nothing not to like about Matt. You hear people describe him, and no matter who you talk to, you get the same response — he's just a gentle giant, never would hurt a fly. He's one of us for sure." Look for Notre Dame to use the memory of James as a powerful emotional connection this season.